10:30 pm - Checkered flag. No. 45 finishes fourth and No. 44 fifth in GT2. Both Lizard Porsches complete another grueling Sebring. Congratulations to Risi Competizione for their win with the No. 62 Ferrari. 10:27 pm - 3 minutes left. 10:23 - Positions: P1 No. 62; P 2 No. 95; P3 No. 21; P4 No. 45; P 4 No. No. 44. P 6 No. 61. No. 62 is pitting for fuel. 10:21 - The No. 44 is in the pits - I think they are adding water, but looks like all is OK.
10:00 - 30 minutes to go. The 07 Peugeot has pulled off in Turn 7. I don't think that it will go yellow but it may. 9:50 pm - The No. 45 just has to hang on and do a fast enough speed to stay ahead of the No. 61 in P6. He is about 30 seconds ahead, and is going 1 to 2 seconds slower than the No. 61. There are 40 minutes left, a bit less than 20 laps. If Joerg can hold this pace, he has a good chance to stay ahead of the No. 61. Also the No. 61 still has one more pit stop and assuming that the No. 45 holds together, we can finish out the race with no more pit stops. 9:40 pm - 50 minutes left in the race. the No. 44 is P4, the No. 45 is still P5. 9:34 pm - Darren Law heads out of pit lane to rejoin in the No. 44. They are in P4. No. 62 is P1, No. 95 is P2; No. 21 is P3. The No. 45 is still in P5. 9:33 pm - Joerg thinks something may have broken in the front. He is still going but can't tell what the issue is. 9:30 pm - Joerg is out again. I think he will be in P6 once the timing and scoring catches up. Johannes meanwhile is now in P4 in the No. 44 and will pit shortly for the last planned driver change to Darren Law, tires and fuel. 9:27 - Joerg is in pit lane. He says that the car will steer to the right, but not to the left. The crew is evaluating if they can repair the car to continue racing. 9:25 - Things seemed OK on the No. 45 and they were ready to send the car out once they refueled, but they cannot get the fuel hose in because of the damage to the hood. They sent the car out again without refueling. Joerg reports that the steering is off and I expect that he will pit again. No. 21 also pitted and is back out again. 9:20 - So...looks like our chance for a podium for the No. 45 may be over but the No. 44 is still in the hunt in P5. I'll report status of the No. 45 once he is back in the pits and we know more. 9:18 - Marc had contact from the No. 21 and is limping back into the pits with significant damage. Tire damage, but we can't tell if the radiators are damaged - hopefully he can make it back in without damaging the motor. 9:13 pm - In the No. 45, Marc is still behind the No. 21 - the No. 21 will pit in 4 laps. He is putting a tremendous amount of pressue on the No. 21 in the corners but has not yet been able to get by. This is for position - if Marc can get by, he will move into P3. Johannes in the No. 44 is in P5. The No. 62 Risi Ferrari holds the lead and the No. 95 Ferrari is P2. 9:11 pm - The No. 45 got split by traffic. A Corvette is now between him and the No. 21. 9:07 - Marc Lieb is now nose to tail with the No. 21. 8:54 - Marc has closed the gap to the No. 21 to 5 seconds. 8:43 - No. 45 now just 9 seconds back from the No. 21 - for position. He'll have him in his sights soon. No. 44 still comfortably in P5. No. 62 is P1 and No. 95 Ferrari is P2. No. 21 P3. 8:41 - Gap narrows to 11 seconds. 8:36 - Gap from the No. 45 (in P4) to the No. 21 (in P3) now down to 13 seconds. Go Marc! 8:32 - Just under 2 hours left to go. 8:27 - Darren got the bobble and strategist Eric Ingraham calls him into the pits. Positions: P1 No. 62; P2 No. 95; P3 No. 21; P4 No. 45; P5 No. 44. During the pit stops, the No. 45 was able to close the gap to the No. 21 - now 16 seconds back. In the No. 44, Johannes van Overbeek is out, still in P5 and one lap up on the No. 61 in P6. 8:25 pm - No. 45 in the pits. Driver change from Patrick Long to Marc Lieb. Tires and fuel. Clean stop and they are back out. 8:23 pm - No. 45 has moved up one position to P3 while the No. 21 was in the pits. However Patrick in the No. 45 will pit on the next lap. 8:21 pm - No. 21 and No. 62 are in the pits for tires, fuel and driver changes. No. 45 will pit shortly. Positions: P1 No. 62; P 2 No. 95; P3 No. 21; P4 No. 45; P 5 No. 44. No. 45 is on the same lap as No. 21. 8:16 pm - The No. 45 will pit in 4 to 5 laps. We expect the No. 21 Panoz, which is one position ahead of the No. 45 to pit about soon as well. 8:02 pm - It's now completely dark on the track. 2 hours 28 minutes left to go. 7:57 pm- Patrick has closed the gap to the No. 21 by 2 seconds. Timing and scoring shows Dominik in the No. 21 - so the earlier Ian James must have been an error. They are on the same lap and Patrick is now running 1 to 2 seconds per lap faster. 7:47 - Darren slid off in 13 but continued without incident. Correction on the driver in No. 21 - timing and scoring is showing as Ian James now, not Dominik. 7:40 - Patrick is 22 seconds back on the No. 21 Panoz. They are both on a fast pace but Patrick is slightly faster. Dominik Farnbacher is in the No. 21. In the No. 44, Darren is also on a good pace, 2 laps back from Patrick. As a thank you to our fans, we are offering 15% off anything in the online store for today only - valid through midnight ET March 21. ** To get the 15%, enter the code "sebring09" without quotation marks in the coupon code box on checkout. 7:30 - Darren has passed the No. 61 and is back in P5. Patrick remains in P4 in the No. 45. Patrick is on the same lap as the next closest GT2 car - the No. 21 Panoz, and is going at a slightly faster pace. In the No. 44, Darren is 2 laps back from Patrick. 7:27 - The No. 61 Ferrari did get past the No. 44 while the No. 22 was in the pits so Darren is now P6. but he is close behind the No. 61 and will work to get past again once his tires are warmed up. 7:23 - Positions: P1 No. 62; P2 No. 95; P3 No. 21; P4 No. 45; P5 No. 44. The No. 44 is in the pits, Darren Law is in the car. They should be able to retain their P5 position after the pit stop. I'll report in a minute. 7:22 - In the No. 44, Seth has the fuel light and will get the bobble shortly. He should pit on the next lap. 7:19 pm - Joerg pits for driver change to Patrick, tires and fuel. He will go out on the same lap as the No. 21, which is still in P3. 7:18 pm - Both the No. 62 Risi Ferrari (in P1) and the No. 21 Panoz (in P3) pitted. The No. 21 is up in the air and they are working on it - calipers are off the car - probably a brake pad change. 7:13 pm - Joerg radioed in that he had a "little moment in turn 5" but continued without incident. 7:10 pm - No change in GT2. The No. 44 will pit in 15 minutes, the No. 45 slightly earlier. 7:00 - The 95, which is in P2, pitted and is heading back out, still in P2. 6:55 - Change of plans, Seth will stay out for now in the No. 44. he is in P5. In the No. 45, Joerg is P4. 6:52 - Seth reports a tire smell on braking. They will bring him in and driver change to Darren Law. 6:48 - Joerg radioed in that something fell apart and he can't fix it. I think it was related to his drink bottle or cool suit. He has 14 laps to go. 6:46 - Joerg in the No. 45 has passed the No. 44 and is now one lap up. Both cars retain their positions. 6:41 - Seth reports that in the No. 44 the engine does not sound right at the top of sixth gear. The No. 44 still in fifth, No. 45 still in fourth. 6:27 - 007 is smoking on track and going slow. Unclear what happened. May have lost a motor. They are off course so will probably not go yellow. 4 hours left to go -more than 1 hour longer than our standard 2 hour and 45 minute race. 6:24 - The No. 44 spun but continued. He may pit for tires. Seth radioed in that tires are OK and he will stay out. 6:20 pm. Positions are: P1 No. 62; P2 No. 95; P3 No. 21; P4 No. 45; P 5 No. 44. No 45 and 44 are 4 laps down on the GT2 leader, the No. 62 Risi Ferrari. They are 2 laps down on the No. 95 in P2 and approx 1 lap down on the No. 21 in P 3. the No. 62, 95 and 45 are all running a similar pace. The No. 21 is slightly slower. 6:15 - No. 44 is pitting for driver change to Seth Neiman, tires and fuel. No. 45 is also pitting for driver change to Joerg Bergmeister, tires and fuel. No. 62, which is stil in the lead, is also in the pits, but the No. 45 beat them out of the pits, gaining back one of their laps. The No. 45 is still several laps down on the No. 62 but we have 4 hours left to go! 6:13 pm - No. 21, which was in P3, is in the pits, No. 61 is also pitting. 6:07 pm - 4 or 5 laps before the No. 45 pits for driver change to Joerg Bergmeister for his third stint, tires and fuel. 6:02 pm - In the No. 45, Marc is now by the No.95 Ferrari, but not for position. Marc is still 2 laps back from the No. 95, which is in second. Under 20 minutes remaining for Johannes in the No. 44 in his stint. 6:00 - The 95 Ferrari came out of the pits and on track just in front of the No. 45. 5:58 pm - The No. 95 Ferrari is in the pits for what appears to be a standard pit stop. They were in P2 at the time of the pit, now 2 laps down from the No. 62 Ferrari, still in the lead. Marc Lieb still in P4 in teh No. 45, Johannes van Overbeek still in P5 in the No.44. 5:29 - In the No. 45 Marc has passed Johannes and taken 4. The No. 44 is 5th. They are both 2 laps down on the next closest GT2 car, the No. 21 and 3 laps down on the 95 in P2 and approx 4 laps down on the No. 62 in the lead. 5:25 - The No. 45 has nearly caught the No. 44 and the pack. 5:20 pm - The No. 45 has free running but the No. 44 is stuck behind the GT2 leaders (but is several laps down) who are going at a slower pace. 5:17 pm - Green flag. No. 44 now P4 and No. 45 P 5. 5:12 pm - No. 45 pits first. No. 44 second. No. 45 took a longer fuel and tires so the No. 44 was out first. No driver changes in either car. The wind is coming up so our rain may be coming. 5:10 pm - Both Lizards are running together and both got the wave by. The No. 45 is in front. Latest plan is that both Lizards will stop for a short fuel. The cars which received the wave by now need to catch up with the rest of the field and they will go green. 5:05 pm - No. 44 reports that there was a fire in the right rear of the No. 45- oil. He says that the fire is now out. Marc Lieb in the No. 45 is P4 and Johannes van Overbeek in the No. 44 is P4. Still yellow. Just under 5 and a half hours to go. 5:00 pm - Marc Lieb caught the pack in the No. 45 - hopefully he will get the waveby. Still yellow. The No. 44 will stay out. The No. 45 may come in for a short fuel but Marc will stay in the car. 4:56 - Tequila patron prototype in the tire wall. Double yellow. Marc radios in that the No. 87 is really slow on course. 4:53 - Darren made it to the pits, driver change to Johannes van Overbeek, fuel and tires. He was in P4 when he pitted. He may need to retake the No. 61 again on track to get back to P4 - I'll confirm that in a minute. 4:50 - In the No. 45. Marc did a 2:04.294 - fastest GT2 race lap so far.He is on the same lap as the No. 61 Ferrari and is working on reeling him in to move to P5. Darren radios in that he is out of gas. He is pitting. Fuel light and bobble and on reserve heading into Turn 7. 4:37 - In the No. 44, Darren passed No. 61 to take P4. Marc Lieb in the No. 45 P 6. 4:34 pm - The No. 44 retook P 5 when the No. 45 pitted and he is now just behind the No. 61 Ferrari. The No. 44 should pit in the next 15 minutes or so for their driver change. 4:33 pm - No. 45 pits for driver change to Marc Lieb, tires and fuel. The No. 45 is P5 - close behind the No. 61 Krohn Racing Ferrari which is P4. 4:10 pm - 9 or 10 laps until the No. 45 pits. 4:06 pm - GT2 positions: P1 No. 62; P2 No. 95; P3 No. 21; P 4 No. 61; P 5 No. 45; P 6 No. 44. The No. 62 is on its own lap, nearly two laps ahead of the No. 95 and No. 21. The No. 61 is 3 laps back from the N. 62. Patrick Long in the No. 45 and Darren Law in the No. 44 are 4 laps back. 3:53 - In the No.45, Patrick passed Darren to take fifth. Darren now in sixth. .
3:52 - Darren is back on track in the No. 44. He will be on the same lap as patrick Long in the No. 45 and is just a few seconds in front of Patrick. 3:48 - The No. 44 got the bobble and will pit for tires,fuel and driver change to Darren Law for his second stint of the race. 3:47 pm ET - Positions: P1 No. 62; P2 No. 95; P3 No. 21; P 4 No. 61; P 5 No. 44, P 6. No 45; The No. 92, which had been in the front pack, appears to have a problem and has pitted, dropping back several positions and allowing No. 44 to move to P 5 and No. 45 to move to P 6. No. 62 Risi Ferarri pitted in what appears to be a scheduled pit stop and is back out again, still in the lead, 1 laps ahead of the No. 95 in P2. 3:42 pm - Patrick successfully negotiated being passed by the overall leader (the 02 Audi) and the No. 08 Peugot who are battling for P1 and driving nose to tail. 3:30 pm - Patrick Long is out again in the No. 45 after tires, fuel and driver change. He is in P7. 3:26 - Joerg reports the fuel light is on and he will pit. 3:20 pm - 4 laps until No. 45 pits for driver change from Joerg Bergmeister to Patrick Long, tires and fuel. about 15 minutes left until the No. 44 pits. 3:14 pm- Race control says that No. 95 in P3 has no headlights. Regularions require that all cars run with working headlights. Correction - race control confirms that 95 does have headlights now. 3:10 pm - GT2 positions remain relatively unchanged: No. 62 has led most of the race since the No. 87 had its problems early on. The No. 92 is in 2nd, and the No. 95 in third. The No. 21 is P4, No. 61 P5, No. 44 P 6 and No. 45 P 7. Joerg radioed in that something fell off the dashboard but doesn't know what it was. 3:06 pm - 10 laps until the next No. 45 pit stop. 3:01 pm - Joerg just passed the No. 44. But he is sill one lap behind him - sorry my earlier info was incorrect. Joerg is P 7, Seth is P 6 in the No. 44. 2:53 pm ET - One of the Peugeots just navigated a huge spin on course - avoiding contact with anyone and continuing. 2:49 - Joerg radioed in tha the car is getting quicker - the grip is coming up on the tires and track. 2:45 pm - No. 44 is out again with Seth Neiman behind the wheel. They are in sixth, No. 45 in seventh. 2:40 Joerg radios in that there is a big vibration in the rear. Actually he said "Bid" , which we guess is mix of big and bad. Joerg says his right foot keeps falling asleep - he may have to pit early for a drive rchange. No. 62 Risi Ferarri, still in the lead, heads out from their scheduled pit stop. The No. 44 will pit shortly for fuel and driver change to Seth Neiman. They are now in their second round of stints. 2:37 - No. 92 is in the pits. 2:34 - Joerg just did a 2:02.997- fastest GT2 race lap so far. He is running 2 to 6 seconds faster than the rest of the field in P 7. He is 2 laps back from the next closest GT2 car, the No. 61 in P 6. 2:30 pm - Positions: P1 No. 62; P 2 No. 92; P 3 No. 95 - they are all spaced approximately 1 lap apart. P4 No. 21; P 5 No. 44; P 6 No. 61; P 7 No. 45; P 8 No. 007; P 9 No. 11; P 10 No. 40. No. 87 is back from behind the wall and has rejoined the race after a lengthy repair. They are in 12th. 2:24 - Marc pits. Short fuel, tires. Joerg is in the car for his second stint and quickly out again. 2:21 pm - Marc got the bobble and will pit this lap. Tires, fuel and driver change to Joerg Bergmeister. He is in P7. 2:07 - Johannes passed the No. 61 Krohn Racing Ferrari and moved into P 5. Marc lieb in the No. 45 is 2 laps down from the No. 61. He is running 5 seconds per lap faster than the No. 61. 2:05 pm - In the No. 44, Johannes is closing in on the No. 61 for position. If he passes, he'll move into P5. Positions: P1 No. 62; P2. No 92; P 3 No 95; P4 No. 21; P 5 No. 61; P 6 No. 44; P 7 No. 45. No. 87 is still in the garage under repair. 2:00 pm - With No. 28 in the pits, Marc Lieb in theNo. 45 moves to P8. No. 44 is P6. They are 2 laps apart. 1:56 - No. 28 Corvette slow on course. Just when we thought things couldn't get any better, rain is forecast for 4 pm ET - 2 hours from now. 1:44 - No 11 Viper went off but avoided wall contact and continued. 1:42 - Green flag. No. 45 in P8 is five laps behind the GT2 leader, the NO. 62 Risi Ferrari. No. 44 in P 6 is 3 laps back. The No. 44 is one lap down on the next closest GT2 car, the No. 61. The No. 45 is 1 lap down on its next closest car, the No. 28. 1:40 pm - Still yellow. Positions: P1 No. 62; P 2 No. 92; P 3 No. 95; P 4 No. 21; P 5 No. 61; P 6 No. 44; P 7 No. 28; P 8 No. 45; P 9 No. 11; P 10 No. 007. 1:38 - Darren pitted for fuel and a quick fix in the cockpit. No. 45 will pit shortly for fuel top up and tires. 1:36 - Race control notified us that the No. 45 (and the No. 40) will both receive the wave by - this is to fix the problem from earlier in which the 45 was held up by the No. 40. 1:31 - Still yellow. The No. 45 crew is very frustrated because they were held up by another car during the yellow who was going very slow and did not receive the wave by, costing us a lap. No. 44 did get the waveby. First ten positions before the restart: P1 No. 62; P 2 No. 95; P 3 No. 92; P 4 No. 21; P 5 No. 61; P 6 No. 44; P 7 No. 28; P 8 No. 45; P 9 No 11; P 10 No. 007. 1:25 - The No. 37 is off track between turn 10 and 11. Double yellow. 1:13- Both Lizards pit - the No. 45 is in first and Marc Lieb gets in the car. Tires and fuel. Johannnes van Overbeek takes over in the No. 44, tires and fuel. 1:11 pm - The No. 11, in P8, had a flat and pitted, moving Patrick into P 8. 1:09 pm - Both crews are ready for their pit stops. We don't have radio communication with Patrick so we aren't sure if he can hear our instructions when to pit. But he'll get the "bobble" soon, which is his sign that he needs to switch to reserve fuel and pit. 1:04 pm - Both Lizard Porsches will pit in the next 10 mins or so for driver changes, tires and fuel. Johannes van Overbeek will get in the No. 44 and Marc Lieb in the No. 45. 12:57 - The No. 87 Porsche just went by, being pushed by its crew as they head behind the wall. 12:50 - No. 87 Farnbacher Loles Porsche has requested permission to go behind the wall - whatever the issue is they can't fix it in pit lane. 12:45 pm - We've lost radio communication with Patrick in the No. 45 - we think he can hear us but we can't hear him. He has 12 laps to go before his pit stop for driver change. He is in P9. Positions: P1 No. 62 Risi Ferrari, P2 No. 92 BMW, P 3 No. 95 Ferrari, P4 No. 21; P 5 No. 61; P 6 No. 44; P 7 No. 28; No. 8 No. 11; P 9 No. 45. 12:34 - patrick radios in that he has a problem but we can't get clarification on what it is. The crew is ready for a pit stop just in case. 12:31 - Patrick Long now P9. Darren Law P 6. 12:30 - Positions: No. 62 P1; No. 95 P2; No. 92 P 3; No. 61 P 4; No. 21 P 5; No. 44 P 6; No. 11 P 7; No.28 P 8; No. 87 P 9: No. 45 P 10. No. 87 still in the pits, next lap Patrick in the No. 45 will move to P 9. 12:26 - The No. 28 is back out again in P8. Patrick is 2 laps down from them in P 10. No. 87 still in the pits. 12:22 - The No. 28 GT2 Corvette was in the tire wall (after apparent contact from one of hte Audis) both cars continued. No. 87 still in the pits, I believe. Wiht the No. 28 and the No. 87 both in the pits Darren Law moves up to P 6. in the No. 45, Patrick is still 2 laps down on the No. 87 and No. 28, so we'll see how long they stay in the pits and if Patrick will move up in position. 12:19 - No. 87 in the pits for an unexpected pit stop. No. 90 also in the pits. Sounds like the No. 87 may have had contact with another car on course - TV shows the crew working on the right rear suspension. The No. 62 Risi Ferrari now in the lead. 12:16 - Positions: P1 No. 87, P 2 No. 62 (both on the same lap with the No. 62 nose to tail with the No. 87); P3 No. 95 (one lap down); P 4 No. 92; P 5 No. 61 ; P 6 No. 21; P 7. No. 28 ; P 8 No. 44; P 9 No. 11; P 10 No. 45; P 11 No. 007; P 12 No. 40; P 13 No. 90. Smoke reported from center rear of No. 90. No. 44 is 3 laps down on the No. 87; No. 45 is 6 laps down. 12:15 - Patrick has passed the 007 to take 10th. Darren is now in P8. 12:05 - Darren pits for a short splash of fuel. No. 45 stays out and gets the waveby and hustles to catch the back of the pack. Patrick will pit this lap for 8 seconds of fuel. 12:04 - In the No. 44, unfortunately Darren in the No.44 is just behind the overall leader so he will not get a chance to get a waveby and catch the back of the GT2 pack. In the No. 44, Darren is now P9. In the No. 45, Patrick is P 11. 12:00 - still yellow. The overall leaders are now starting to pit for tires, fuel and driver changes. Darren radios in that the No. 44 is "very reasonable - pretty stable, that if it stays like this he should be good for the whole stint." 11:55 - The Tequila Patron prototype and the No. 40 got together - right in front of Darren but luckily he was able to avoid the incident. Damage to both cars but both have continued back to the pits. Double yellow. The Patron car didn't stop in its pit stall but continued back on track. Hopefully both cars will get the wave by and possibly regain a lap on some of the GT2 field. 11:52 - No. 45 in the pits. Fuel and tires. Patrick Long heads out. They are in P12. Clean, fast pit stop. 11:49 - Joerg has the (fuel) bobble, goes to fuel reserve and will pit the next lap for tires, fuel and driver change to Patrick Long. No. 45 still P 12, No. 44 now P10 (the No. 007 still in the pits for repairs after their tire wall incident). The No. 87 passed the No. 45 cleanly as Joerg prepared to enter pit lane. 11:48 - Car off in turn 17. Looks like the 007 in the tires at turn 17. Looks like he will be able to continue and will pit. 11:44 am - No. 44 is out with Darren Law in the car. Sticker tires, full fuel. 11:40 - No. 44 will pit for fuel, tires and driver change from Seth Neiman to Darren Law. No. 45 will pit in a few minutes. Joerg in the No. 45 has made up a lap on the next closest GT2 car - the No. 28. Joerg is in 12 after being hit by the No. 40, resulting in a 12 minute pit stop to repair the left rear toe link. Seth radios in that the has a flat tire - he's coming in to the pits shortly. 11:34 - No. 87 back in the GT2 lead. No. 62 P2, No. 95 P3. 11:31 - Strategist thomas Blam notifies Joerg that he has 8 laps remaining in his first stint. Patrick Long will take over in the No. 45 for his first stint. The No. 44 has moved into P 10. The No. 44 will also pit soon and Darren Law will take the wheel. 11:30 - No. 87 pits for tires and fuel. No. 62 takes the lead. In P 12, Joerg is running at the pace of the No. 62 - they are by far the fastest GT2 cars on track right now, running 3 to 5 seconds faster than the rest of the field. 11:26 am - GT2 positions remain basically unchanged. No. 87 is P1, No. 62 is P2; No. 21 is P3; No. 61 P 4; No. 95 P5 (just received a 20 second hold for no balaclava for pit stop supervisor during pit stop); No. 92 P 6; No. 007 P 7; No. 28 P 8; No. 40 P 9; No. 11 P 10; No. 44 P11; No. 45 P 12. No. 90 has entered the race (after failing to get going from the grid and being pushed behind the wall for repairs) but is now 28 laps down on the overall leader. 11:00 am - Quick recap of the first 30 minutes - a rocky start for the Lizards - Joerg Bergmeister was in third position when he was hit by the No. 40 as it attempted to pass. The impact broke the left rear upright and cost the No. 45 12 minutes in the pits. Joerg is now in 13th. In the No. 44, Seth Neiman spun early in the race, requiring an early pit stop for new tires. he is in 11th. We still have over 11 hours to go. 10:54 am - Joerg is back on the pace and just clocked a 2:03.933 - the fastest GT2 times on the track right now. The No. 02 Audi is in the overall lead. 10:51 am - No. 87 is P1; No. 95 P2; No. 62 P3 (having moved up from the back of the pack); No. 21 P4; No. 40 P 5; No. 61 P 6; No 92 P 7; No. 11 P 8; No. 007 P9; No. 28 P 10; No. 44 P 11; No. 45 P 12. the No. 90 BMW has not yet joined the race and is in 13th. 10:47 am - No. 45 is back out he is in 13th and has lost 5 or 6 laps on the field during the pit stop to repair the suspension (replaced a toe link on the left rear) after being hit by the No. 40 early in the race. Joerg reports that the steering wheel is off to the left. 10:45 - Positions: P1 No.87, P2. No 95, P 3 No. 21, P 4 No. 62, P 5 No. 40, P 6 No. 61, P 7 No. 92, P 8 No. 11, P 9 No. 007, P 10 No. 28, P 11 No 44, P 12 No. 45, P 13 No. 90 (No. 90 has not joined the race yet). 10:44 - We saw a replay of the No. 44's spin early in the race, which resulted in an early pit stop. Neiman was able to avoid the tire wall, and no damage to the car. 10:40 - The No 45 still in the pits. The crew is replacing some of the suspension links in the pits. 10:36 - Joerg thinks that the left rear upright is damaged. The crew will fuel, then evaluate the problem. They are replacing the left rear upright in the pits. 10:35 - No. 45 was hit by No. 40 Ford when the 40 attempted to pass. Joerg thinks that the rear axle may be broken but the crew is hopeful that it is jut a rear tire. Joerg is pitting. 10:32 am - No. 87 is P1. The No. 95 Ferrari has taken second, the No. 45 is third. No. 45 is attempting to pass with the Robertston Ford just behind him in P4. Joerg Bergmeister is in the No. 45. The No. 44 is 12th. No. 44 is pitting - not sure what happened. Will report in a minute. Fuel and tires. 10:31 am - A clean start for the entire field. I'll report positions in a few minutes. 10:30 am - Green flag. The No. 90 BMW has gone behind the wall for repairs. the 2nd Peugeot has joined the race from pit lane. 10:26 am - The cars are heading out for their single pace lap today. All cars appear to be on the grid except one of the Peugeots which is in pit lane under repairs. One GT2 car still on the grid - not sure which one it is - it's the 90 BMW - they are pushing it quickly back to pit lane for repairs. 10:22 am - 8 minutes to race start. One pace lap. 10:14 - Race control has notified drivers to get in their cars. 10:06 am - 24 minutes to race start. 8:25 am - Checkered flag.In the No. 44, Joerg is called into the pits. Both cars will do a set of pit stop practices with driver changes. 8:21 am - No. 44 pits. Darren and Johannes will not go out this am. Joerg is still out in the No. 45. 8:18 am - 7 minutes left in the session. 8:16 am - No. 45 pits for a setup change and fuel. No. 44 is also called into the pits for tires. 8:10 am - The No. 44 pits for fuel and tires. 8:08 am - Joerg is currently P5 in the No. 45. Seth is P 7 in the No. 44. All good so far. This morning's warmup session is 25 minutes - till 8:25 am. 8:00 am - Green flag. The Lizard Porsches are out. We have timing and scoring now but no TV feed. Seth Neiman in the No. 44, Joerg Bergmeister in the No. 45. Good morning from Sebring. We are five minutes from our morning warmup- the final chance to make any changes before the race, which starts at 10;30 am ET. Joerg Bergmeister is in the No. 45 and Seth Neiman is in the No. 44. Unfortunately our TV feed just went south so we may not have TV or timing coverage for this session. 10:46 - Green flag. Johannes is out in the No.44 and Patrick in the No. 45. 10:36 - Just under 20 minutes left in the session. Patrick long is still P1 in the No. 45. Johannes van Overbeek is just getting into the No. 44, taking over for Seth Neiman. Red flag - Richard Lietz is in the wall in Turn 9 the No. 87 Farnbacher Loles Porsche. 10:20 - Patrick pits for fuel, check tire pressures, and a setup change. Still P1. No. 87 now P2. No. 44 is P3. 10:15 - Patrick Long is now P1 in GT2 with a time of 2:03.794, on fresh tires. Darren is P 2. Darren pits for driver change to Seth Neiman. 10:11 am -Darren is now P1 in GT2 with a time of 2:03.988. 10:08 am - Darren Law is now in P2 in the No. 44. Times are slower than qualifying - the track is cold and still a bit damp from the mist and fog which covered the area this morning. The sun is starting to warm things up a bit. I expect race start tomorrow to be very similar conditions. One of the most challenging aspects of a race like Sebring is the range of track conditions that teams can face - the race starts at 10:30 during the start of the heat of the day and ends at 10:30 at night - temperatures can differ significantly, even here in temperate Florida. 10:05 am - Patrick will pit for fresh tires. Darren is still out in the No. 44. Patrick is currently P3, Jaime Melo (who has just arrived from Italy) is P2 in the No. 62 Risi Ferrari. P1 is the No. 87 Farnbacher Loles Racing Porsche with Wolf Henzler at the wheel. 9:50 am - Patrick Long is in pit lane in the No. 45 and Darren Law is in the No. 44. Stefan Pfeiffer gave us the run down on this morning's practice - Patrick will go out on used tires for the first few laps to do a shakedown. Then they'll switch to fresh tires and start their setup work. 9:45 am - Good morning - we are just about ready for morning practice which starts at 9:55 am. It will be a bit of a hustle this morning to finish setup work - we weren't able to do much last night in the night practice session because of the rain and resulting wet track. 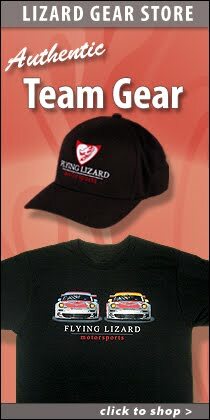 A reminder that we'll be broadcasting our radio all day tomorrow - for details go to www.lizardms.com - the "Follow the Race Tab." 8:53 pm - Darren and Patrick pit together and the evening practice is complete for the Lizards. All six drivers have done their 3 laps so we are heading back to the garage. We'll see you tomorrow for the 1-hour Friday practice at 9:55 am ET. 8:49 - Patrick asked for a few more laps so he could check the traction control. 8:46 pm - Thomas Blam calls Patrick into the pits - he's done and most likely they will head back to the garage. In the No. 44, Darren will just do his 3 laps and then they are done. 8:41 pm - Seth pits for driver change to Darren Law. We couldn't hear Seth on the radio but believe he said an alarm of some sort. They will check it before Darren goes out. Patrick's driver ID is now working. 8:40 pm - It appears that Patrick's driver ID is not working so they are pitting him to plug in his driver ID plug, then they'll send him out again for one more lap. 8:27 - The No. 44 is idling in pit lane in the No. 45 pit stall. The No. 45 is refueling and is now in No. 44 pit stall. Johannes is cleared to go out in the No. 44 and Joerg will head out as soon as the fuel is done. 8:20 - Marc is in the pits after doing his 3 laps and then completing a fuel test. Joerg is getting ready to get in. By the end of his stint, Marc's times were down to 2:05.464 - just a few seconds off of the qualifying times. He reports that the track is now almost dry. Johannes van Overbeek in the No. 44 is heading from the paddock to pit lane. 40 minutes left in the session. 8:04 pm - Marc is out on track. Lap times are 12 seconds slower than earlier today -- everyone is being very careful. 8:00 pm ET - Looks like we have some action now - Marc Lieb is on the radio in the No. 45 heading to pit lane. The No. 44 will be another 20 mins or so. We have one hour to complete the 3 laps for each drivers. Neither car will attempt any setup changes during this session - it's cold, wet and will soon be very dark so it will not be of much use for setup work. Marc will head out on slick tires - the track is now dry enough. 7:45 pm ET - Evening practice is underway but only a few cars are on track - the two GT1 Corvettes and the Audis. We had very heavy rain around 5:30 pm today which flooded the track and paddock. Luckily the rain was over by 6:30 and there's a nice breeze so things are drying out quickly. The Lizards should be underway in the next 30 minutes or so. Each driver is required to do 3 laps during this night practice. Patrick Long took advantage of the break to be a guest on the SpeedTV evening show tonight being filmed above pit lane. 3:15 pm - Joerg qualified second in GT2 in the No. 45. The No. 44 will start 13th on the grid. No. 87 Farnbacher Loles Racing Porsche is on the pole. 2:55 - Joerg has moved to P2 with a 2:03.433. He is just 4 tenths of a second behind the No. 87 in P1. Strategist Thomas Blam has called Joerg into the pits. There's a lot of the dirt on the track now and Thomas and engineer Stefan Pfeiffer make the decision to bring Joerg in. Positions: P1 No. 87, P 2 No. 45, P 3 No. 95. No. 44 is in P 12. 2:55 - The No. 92 is in the pits with an apparent problem - they are putting it on rollers and heading back to the garage. 2:52 - Joerg is P3, No. 87 has moved into P1 with 2:03.051. No. 95 is P2 with a 2:03.579. Joerg is 2:03.642. Seth is in P12 in the No. 44. 2:51 pm - Joerg is P2, with a 2:05.859. Mika Salo in the No. 62 is P1 with a 2:04.930. 2:48 pm - Joerg radios in that there is less grip than this morning. He's warming up the tires getting ready to try his first fast lap. 2:45 pm ET - Green flag on qualifying. Joerg and Seth are both on track. This is a 25 minute, GT only session. 2:35 pm ET - Good afternoon from Sebring. Qualifying will begin in 10 minutes. Joerg Bergmeister will qualify the No.45. Seth Neiman will qualify the No. 44. 10:47 - Seth pits for a damper change. He will stay in the car. 10:45 - Patrick pits for fuel. He will stay in the car. 30 minutes left in the session No. 87 Farnbacher Loles is now in P1. The No. 21 is P2 and Patrick is P3. 10:33 - Patrick Long in the No. 45 is now P1 with a 2:03.940. Times are beginning to come down now. 10:28 am - No. 92 BMW is P1; No. 90 BMW is P2; No. 21 Panoz is P3. No. 45 is P4. No. 44 is P 12. Times are slower this morning than yesterday's sessions - the track is cold and tires are still warming up. A reminder that qualifying is this afternoon at 2:45 pm. 10:15 am - Good morning from Sebring. It's a bit cooler today with some low clouds and a light breeze. Both Lizard Porsches are in pit lane preparing for this morning's practice session which starts at 10:20 am ET. The Daily Reptile newsletter is now available - see the Daily Reptile tab at www.lizardms.com. We'll publish this *most* track days at each race. Darren Law is in the No. 44; Patrick Long in the No. 45. Checkered flag - the top times of the session were: No. 87 P1, 2.02.591. No. 45 P2 2.03.258. No 62 P3 2.03.303. We'll be back with you tomorrow for the morning practice at 10:20 am ET. 3:30 pm - Patrick Long is now out in the No. 45. 3:19 pm - Seth Neiman in the No. 44 pits for a driver change to Johannes van Overbeek. GT2 qualifying will be held tomorrow, Thursday at 2:45 pm ET. 3:04 pm - Welcome back - it's the second session of the day today and both Lizard Porsches are on track. The No. 45 missed this morning's sessoin as the crew worked to diagnose an electrical problem. All is now resolved and the No. 45 is on track with Joerg Bergmeister at the wheel. Seth Neiman is out in the No. 44. 11:37 - Checkered flag. We are heading back to the garage. We'll be back for this afternoon's session. 11:35 - Seth radios in that the Ferrari is stopped on track. Red flag. The No. 44 pits. 11;26 am ET - 14 minutes left in this morning's practice session. The No. 44 has been cycling through setup changes over the session. Seth Neiman is in the car and Chief Engineer Craig WAtkins calls him into the pits for a rollbar, damper and ride height change. The No. 44 is currently P5 in the session. The No. 95 Ferrari has the fastest time of the session so far, a 2:02.897. The No. 87 Farnbacher Loles Porsche is P2 with a 2.03.046. The No. 92 BMW is P3 with a 2:03.056. No. 62 Risi Ferrari is P4 with a 2:.03.096. 11 am ET - Good morning from Sebring. Today is the first official practice day of Sebring race week. We've been testing since Monday. It's warm and fairly dry so far here at the circuit. we had some rain last night but sessions have all been dry. Darren Law is out in the No. 44 right now. Darren will be driving with Seth Neiman and Johannes van Overbeek in the No. 44. The No. 45 is in the garage and will not be heading out for this session. The No. 45 driver lineup is Joerg Bergmeister, Patrick Long and Marc Lieb. In the test sessions earlier in the week, the Lizard Porsches have been consistently running in the top lap times, with the No. 62 Risi Ferrari and the No. 87 Farnbacher Loles Porsche. I spoke with Thomas Blam, Lizard Chief strategist this morning. He commented on the field so far, "Based on what we've seen in testing this week, it looks like we'll have some very strong competition in GT2. The European Ferrari entry is proving to be very quick - we now Bruni is fast and he's been showing it. The Rahal Letterman BMW has also been consistent - not the quickest, but in the top 5 or 6." "The No. 45 Lizard Porsche did well yesterday - we are pleased with our progress so far this week. The No. 45 will be out for this afternoon's session. Our focus from there will be getting ready for qualifying - that's our primary goal for Thursday and also to make sure that everything is set for night practice. The track can be very dark here at night so we have to make sure that the headlights work well, and that the drivers can see effectively at night."